An odd thing is happening to journalism amid the chaos of humanitarian disasters these days. It’s becoming as managed, influenced, nuanced and manipulated as the worst of government spin controlled journalism. 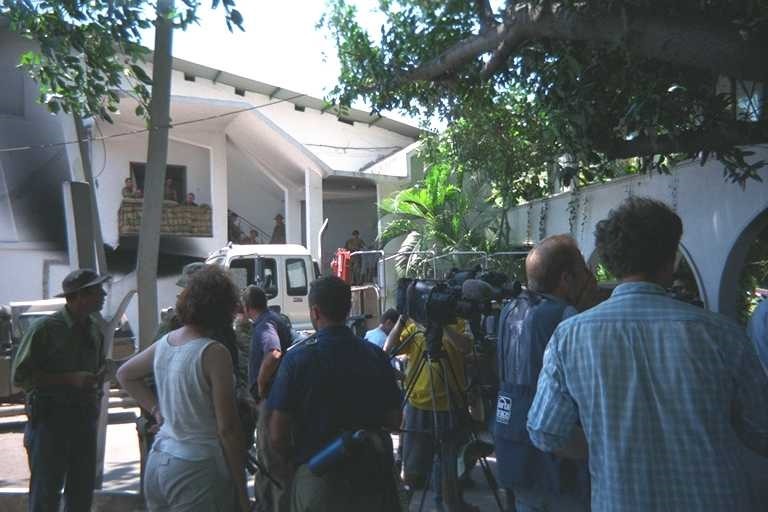 Relief Supplies Arriving in Dili East Timor. 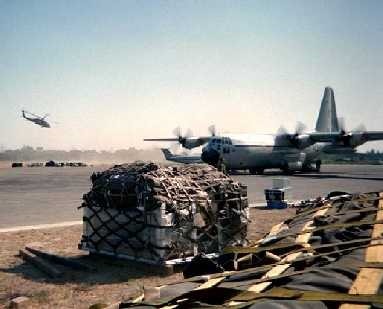 Canadian C-130 Hercules bring some of the first relief shipments to East Timor after the Indonesian Army ran amok following the Timor vote for independence. Over the past years I’ve experienced at first hand a most remarkable change in how the media works in humanitarian disasters such as Albania, Kosovo, East Timor, Afghanistan and the list grows. Amid the hellish dangers of such places there is now a formal dance of intricate detail between United Nations officials, aid workers, reporters, and news managers. It’s a dance that allows a reporter newly parachuted into some vile human emergency to hit the ground running and be filing within hours, if not minutes, direct from the front lines or from the edge of a mass grave. The days of a foreign correspondent needing to spend huge amounts of time just finding out where to go for information in a disaster area, after spending hours if not days just trying to find accommodation and a filing point, are gone. Instead, there is an mobile world wide army of disaster officials, information officers, spokespersons, and spin doctors that can provide the itinerant reporter with everything they need, including food, lodging and transportation. Indeed, it is now possible for a lazy reporter, and there are too many of those, to file as though from the circles of hell yet in reality be sitting in the closest five star hotel. In fact I believe that information flow and control by UN Agencies and relief groups is now so thorough, so complete, that it is possible for a reporter to make a name reporting a humanitarian disaster without leaving Ottawa, Toronto, New York, London, or wherever. Now, I’ve been on both sides of the fence. While I advise aid groups on how to handle the media and I have managed information campaigns directed at foreign correspondents, I have also spent time in the back-of-beyond amidst the starving and the murdered with a microphone, camera and tape recorder. As a result I can bring a unique, if schiz oid, perspective to what’s going on. What I’ve seen over the past years is a disturbing acceleration of news management that started about the time of the Great Ethiopian Famine and the Collapse of Somalia, but then continued to a somewhat greater extent in Bosnia. I say disturbing from the viewpoint of a former broadcast journalist, yet I am in the thick and heart of that very management. In places such as Chechnya, East Timor, Bosnia, and a bunch of smaller cesspits of human disaster, and in others to come, there exists a sophisticated world wide media industry managed by aid groups and United Nations agencies. Every aid group of any significance now has a corps of information people who at the very drop of a starved nomad, the spark of an ethnic cleansing house burning, the wail of a war orphan, will be on an aircraft within hours doing their damndest to race the true foreign and war correspondents to the sharp end, the place where people are dying. Until a few years ago the only people racing to the nasty sharp end were those journalistic firefighters or Bang Bang Artistes who only come alive during the overture to Armageddon. They’d get the word out and that would goad the UN and aid groups to mobilize and it would trigger the usual influx of other reporters. But these days, for every hard bitten disaster journalist plunging into the front lines there is a humanitarian spokesperson or media manager right there beside them. The aim isn’t to necessarily get the name of the organization into the reporters’ stories, although that is nice when it happens, but rather to become a source of information for those who haven’t or won’t leave home base. The goal is to establish yourself and your organization as a credible source of information, to become an ersatz reporter or news agency that others will turn to as a matter of course. This results in publicity and sometimes media prominence which pays off hugely in increased government funding and public donations. The United Nations Office of Humanitarian Affairs, and the office of the United Nations High Commissioner for Refugees play this game seriously and very well. Every day in a disaster area now starts the same way. The local United Nations or more likely the UNHCR spokesperson will hold a morning briefing on latest developments. If a military force is involved then a senior officer will follow, then a series of lesser briefings will be hosted by the aid groups active in the region. Throughout the rest of the day an army of aid information officers will chat up, lobby, spin, and befriend reporters and especially the all important news producers with the big television networks. At the same time, information is being relayed to domestic media back home from the head offices of the aid groups. News releases tailored for domestic if not local interest flow on a daily basis, op-ed pieces are written, interviews and news conferences are arranged for returning aid workers. The ease of getting information out of even the most isolated disaster area through internet links, satellite phones, and certainly in the cases of Sudan, Iran, East Timor and Albania/Kosovo, by mobile phone means that outfits such as CARE Canada, WorldVision, the Red Cross, or any of the other biggies, can and do provide domestic news outlets in Canada with information before even their own reporters can. It’s not just information. 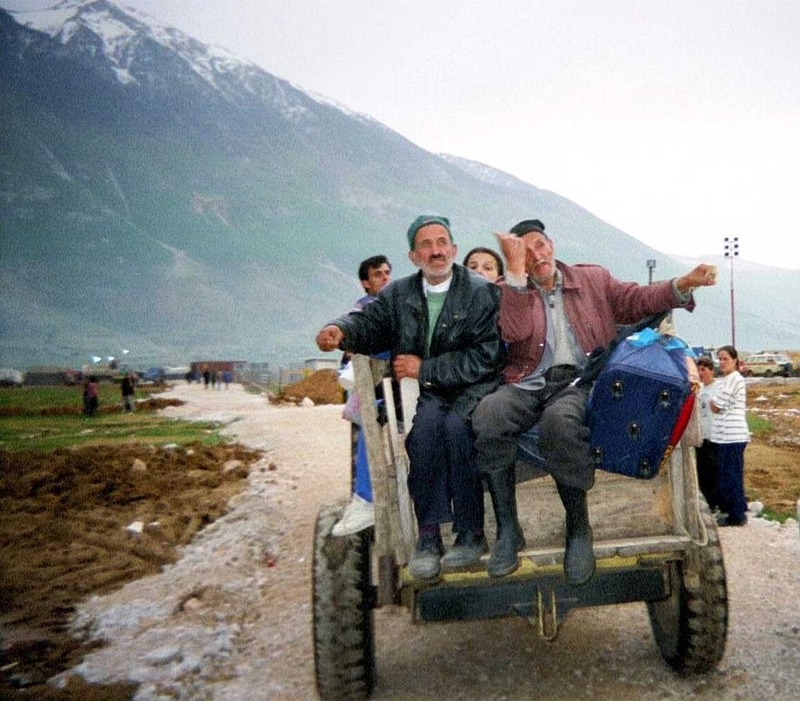 When Albania was overwhelmed by Kosovar refugees I was able to provide video clips over the internet for any agency that wanted them. Local radio stations which are notoriously understaffed and utterly unable to put anyone into the field were able to connect into the CARE web site and download a 30 second report for use on their newscasts. It didn’t matter to them that the piece was supplied by a CARE official who mentioned the organization’s name as much as decency allowed and clearly had a point of view if not bias — it was material they could use. Aid agencies and organizations these days now have elaborately written Communication Strategies every bit as tightly focused and as effective as those in any major corporation. More and more aid groups are building communications departments which, if you blur your eyes just a bit, look an awful lot like news gathering operations. In fact, quite a number of these departments are staffed by former journalists. It is now entirely possible for an unscrupulous reporter to cobble together a mass of first hand material in word, picture, and sound from aid agency sources and produce a seemingly on the spot report from say, Iran, Sudan, or Iraq and yet never have left this country. I hope to god it hasn’t happened yet but I just know that it will. In the meantime the true professional disaster reporters will continue putting their lives on the line. Of the perhaps two or three hundred real Bang Bang Artistes in the world a significant number are Canadian. Whether they are working for the Globe, , the CBC, the National Post, any of the American networks, or some other global news outlet, they do their job so well and honourably that people like me don’t have to bother worrying about getting their attention. They decide on their own whether something is a story and that’s the way it really should be. I wish their tribe long life.